It's been a year and a half since I shared the re-do of my daughter Lily's bedroom. In the original post, I wrote about how it all evolved, and also about the (many) things I don't love about the room. Fast forward to this spring, and my irritation with the general look and feel of the room hadn't changed. 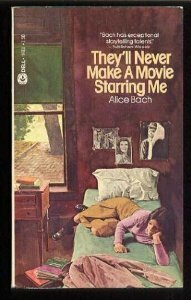 In fact it was worse, because now the room was thoroughly lived in and thoroughly messy and more, it was clear that Lily couldn't hang out in the room with her friends because there wasn't anyplace to sit. Around this time, in my despair to find a way to rearrange a room that just can't be very rearranged, I remembered the little orange futon that used to live in the playroom. After rearranging the playroom/guestroom, the futon was living out in the garage, waiting for me to put it up for sale on Craigslist. One Saturday afternoon when I went in to dust and straighten the bedroom, I got completely fed up and started hurling piles of crap out into the hall and getting that "thousand mile decorator's stare" as I leaned in the doorframe and started cooking up a plan. Within the hour, I had the husband hauling that heavy orange futon out of the garage and up the staircase. (I have such a nice husband. Have I mentioned that?) Anyway. I rearranged the room and later that weekend, hung up the shelves (that used to live in my entryway). I'd been promising to do that forever, and Lily and I were both glad that I finally came through. It allows her to display her Josef birthday doll collection (note that they stop at 9 -- because she didn't have any display space, they didn't get purchased these last 2 birthdays). It also lets her display the "potion" crafts that were a big part of her summer. So her room was completely rearranged, but still needed a good sorting and re-organization of so much clutter. But then summer hit and the kids were out of school, and so for the entire summer her room was merely different, but still not really done (or cleaned). 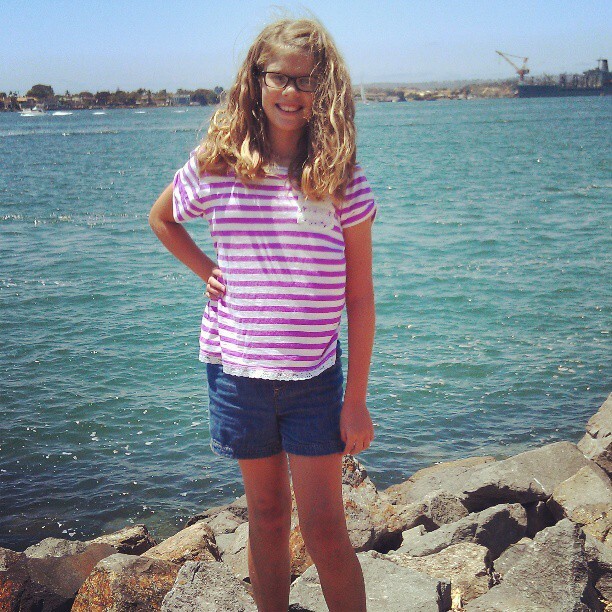 Now they're back in school, and this week I've been cleaning and cleaning and throwing things out and helping to find better storage and organization options for her. She's been a Japanese manga and chibi drawing fool lately, which is cute, but also means that her desk (and the surrounding floor) have been littered with papers in various stages of creation. Since she's in middle school now, and since she's starting to do her homework alone in her room, we needed to clean up the chaos and make it a better space for studying along with the creativity. The drawers are cleaned out, the crayons and markers are sorted and contained, and I bought her the pink paper organizer at Ikea this weekend. Her vanity area is now next to the door, and the surface was also a big cluttered mess of lip gloss, earrings, Harry Potter wands, marbles, papers, etc. And she'd stopped wearing most of her earrings, because they were lost in her equally cluttered little jewelry box. I bought the earring tree at Michael's, and she loves it, and loves that I found & sorted her earrings. Let's see how well she can keep up with actually using it! Some cheap purple Command hooks serve to display her soccer medals and Disney pin lanyard. I want to buy some nicer, real hooks to install to the left of the mirror for necklaces and scarves. So far I haven't found anything I like, but a trip to Anthropologie would probably solve that. The fact that she still prefers to crawl into my bed on lazy weekend mornings to sit and read gives me hope: it tells me that in a couple years, she'll likely get tired of exotic loft-sleeping, and want a regular bed again. Already, she has to duck down to get into the bed, and she certainly can't sit up in it. She's mentioned wanting a chandelier -- until I reminded her that she can't have any hanging fixtures while the loft is up. I'll be more than happy to oblige when that time comes. Until then, she's an eleven-year-old girl who still feels that she has a pretty awesome bedroom, no matter what mom thinks. And mom just thinks she's a pretty awesome kid. You can see all the bedroom Before shots in my original post about her bedroom, here. Linking up with Jules for the William Morris Project. Last Friday, a chill went through me when I learned that Eydie Gorme had passed away at 84. Celebrities die all the time, and sometimes it gives us pause, and more often we say, "who? Oh....right. Her/Him." But sometimes we get a little misty and take a longer pause, like the last time I was inspired to write about music. If George Jones was the artist who most reminds me of my dad (for so many reasons), than it's probably the sound of Eydie Gorme who most makes me think of my mother. Well, her and Johnny Mathis. 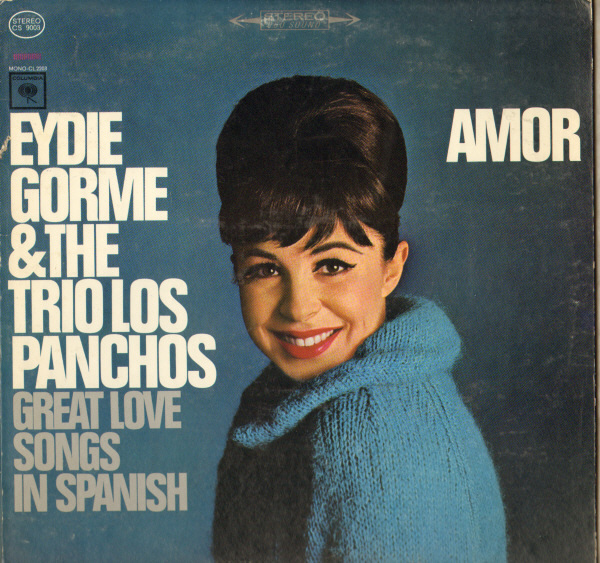 Eydie Gorme reminds me of so, so many things. Of being a child in both my parent's and grandparent's homes, sitting and listening to their stacks of albums. Of late Sunday brunches that my dad worked over all morning, eggs benedict with creamy cheese sauce and Bloody Mary's (for them) and Sunny Delite for me, both served in tall glasses that he'd chilled first in the freezer. And Eydie Gorme and her Amor album on the hi-fi. It's the Amor album that we all loved best, and by "we all" I mean most of the members on my mom's side of the family. As I have (or haven't?) mentioned here before, I'm half-Mexican American, on my mom's side. If I mention this, people who aren't familiar with the cultural makeup of Southern California will ask, Ohhh. So where's your family from?" implying that my mother was born in Mexico or a Latin American country. But no, my mother's family are from here, from this native ground of Santa Ana winds and palm trees and balmy Christmas mornings. What this all has to do with Eydie Gorme is that I find it funny and ironic, how a white girl from New York City produced an album that’s so beloved in so many families like my own. 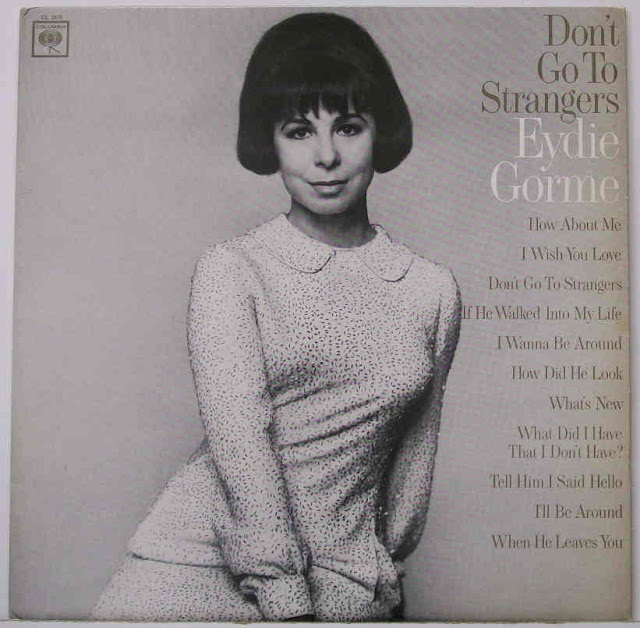 What this all has to do with me is that, in a way, Eydie Gorme is the reason I'm writing a memoir, rather than sticking to my first love, fiction. A crackle and hiss as the needle falls and I watch the album spin, black and grooved as the comb marks through my grandfather’s oiled hair. Now come the guitars, nearly as high, sweet and mellow as the female voice that follows, all surging through the box speakers on either ends of the couch. This time, I’m sitting cross-legged on my parents’ hardwood floor, but I could just as easily repeat this scene, with this same record, on the floor of any of my relative’s homes. Like my grandparents, for instance, who live only minutes west of here across the dry concrete riverbed of the San Gabriel, tucked against the rolling foothills miles east of East L.A. Many afternoons I’ve laid on my belly my grandma’s carpet, her raised blue shag burning its pattern onto my bent elbows, studying the album cover of her copy of Eydie Gorme and the Trios Los Panchos Sing Great Love Songs in Spanish, a 1964 recording that’s about the closest thing we have to an heirloom in this family. 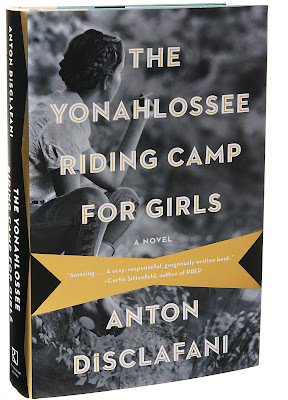 Each household has a copy – my grandparents, my mother, assorted aunts and uncles. In each house I’ve sat and studied the album cover as the familiar notes fill the air: Eydie with her Liz Taylor-Cleopatra eyeliner and fake eyelashes, her glossy black beehive and turquoise turtleneck; a lovely Jewish girl singing a flawless “Sabor A Mi” that makes my mother’s eyes well up. It’s uh…the taste…a taste of me. A taste of me? Seeing my skeptical frown, she finally waves her hands before her face and says, Well, it’s hard to explain in English. You know, love. What else is there to sing about? That album, and my story, which is also thinly-veiled memoir, are another story altogether. Which is why I'm finally writing that memoir. So many stories to tell. For now, here's "Piel Canela", that first song on the Amor album that starts playing when the record needle drops into the grooves. I know all the songs by heart and sing along --- phonetically. I still have no idea of most of what she's singing about. Except, you know, love. What else is there to sing about?